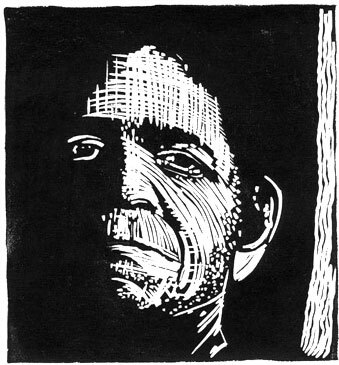 Here’s another linocut from my archives that I made in the 1980’s employing a technique used by Edvard Munch. It’s the “jigsaw” method, meaning that you cut apart the elements of the lino block that you want inked separately. Then they are carefully assembled on the bed of the press and printed all at once. In this case I wanted the central figure on a gradated background with a horizon line more or less in the middle. Guess I could have done this with two registered linocut plates but would have needed a super large roll-up roller to get the rainbow effect on the background. 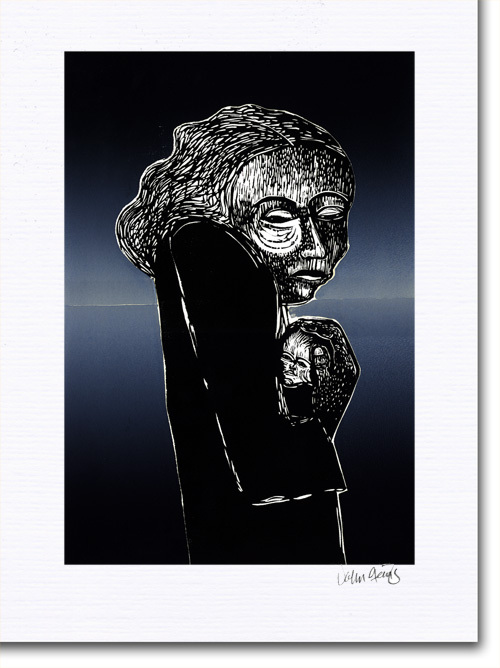 This ode to motherhood certainly owes a lot to Kathe Kollwitz and her strong, dark graphics that were rife with messages of social conscience. 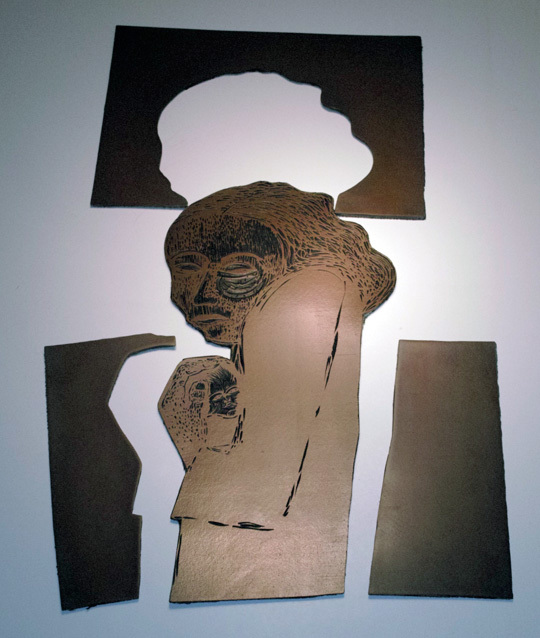 Here’s a picture of the pieces of that when assembled make up the whole linocut. As you can see, I ink up each piece, and then – very carefully – re-assemble everything on the bed of the press. Then I will lay the paper down carefully and run it through and with any luck get a good impression. A person could hand burnish this if no press was available although it might be tough to get a deep, even black. I have just recently revisited your website and, once more, find so much great infomation. I have done quite a few traditional linocuts but this is the first time I’ve seen this done. I want to try using it in the future. Hi John, Thanks for visiting and for your comments. Yes the “jigsaw” method can produce really good results. Let me know how you make out. I love the print as shown in the first one! Do you have any for sale? This arrested me. Thanks Gretchen, I’m glad you like the print. I can provide a very nice digital reproduction for $75 or $250 for an original. I think I have one or two left in the edition.